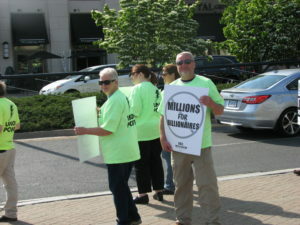 Union members voiced their displeasure with the recently passed budget by protesting outside the annual Democratic Party fundraiser Thursday at the Connecticut convention center. Donning neon green “Union Power” shirts and holding signs that read “Jobs Not Layoffs,” 60 to 70 protesters stood at street corners as passers-by honked horns. Union leaders including Lori Pelletier, president of the AFL-CIO, attended the protest. In the face of mounting deficits after years of unsustainable policy, Democratic Party leaders appear to have made a shift, albeit one that has turned their most ardent supporters into some of their harshest critics. In the past, the Democratic Party in Connecticut has enjoyed support from unions which have been very influential in state elections and throughout the legislative process. For example, the unions supported Malloy in both his gubernatorial elections and Rep. Joe Aresimowicz, the current majority leader and likely the next speaker of the House, works for the American Federation of State, County and Municipal Employees. However, this year, following the two largest tax hikes in state history, the state was looking at massive deficits. Malloy began to warn about a “new economic reality” and pushed a tight budget forcing layoffs. Despite the new budget and the layoffs, the state will see big deficits again soon and the once-friendly state unions are now lashing out at the people they supported and helped elect. “We’re upset about the way this budget was passed, which was a pretty austere budget and we don’t believe that it has anything to do with core Democratic beliefs,” said Jim Vigue, political director for the Connecticut Employees Union Independent.